The name of these cookies is a mouthful, but then again, the cookies themselves are, too. In the original recipe, it appears that the baker made small sandwiches. I’m not sure how the baker did this. I followed her instructions to make tablespoon-size balls and to squash them with the bottom of a glass. I situated each ball two inches from its neighbor. Still, they baked into one another. 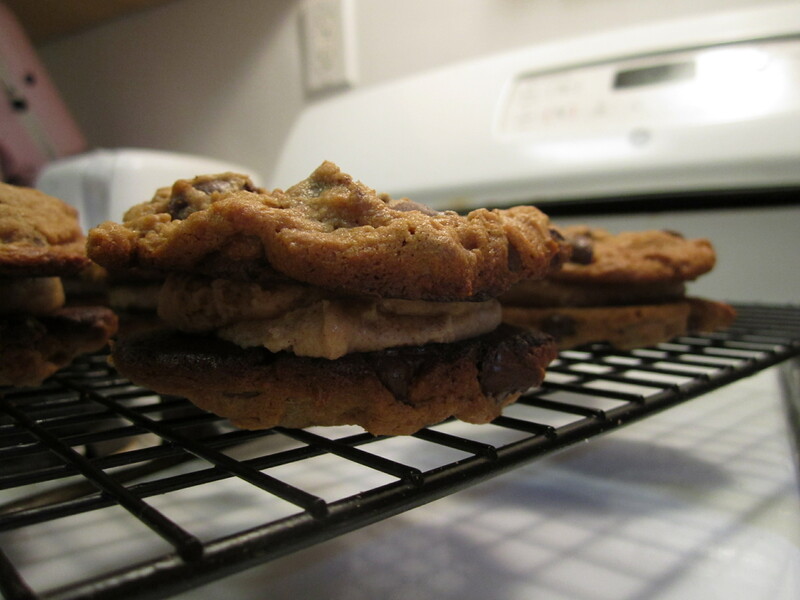 My batch yielded 15 cookies, not 16, which made seven sandwiches with one bruised and broken cookie leftover. Flourless, the cookies were hard to roll into balls, but tasted delicious. The filling, made with a recipe lifted from the heralded Bouchon Bakery, is sweet and light, tasting of cinnamon cream instead of the heavy flavor of peanut butter. As you can see, my cookies are on the large side. The recipe isn’t great, but the results are pretty good. I’m fairly sure this recipe is gluten-free, also.